Big fan of the classics (especially nineteenth-century literature), scientific pieces, cultural studies, historical fiction (as long as it's well researched), and drama. Malcolm Gladwell has always impressed me with his ability to take seemingly disparate elements and link them together to reach a new understanding of a subject. Reading Outliers was like watching a magic trick. This time around, however, Gladwell's book resembles not so much the work of an adroit scholar as that of an aging magician. 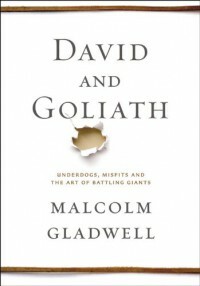 David and Goliath analyzes classic and contemporary underdog stories to reveal that, in many cases, the seeming deficiencies of the underdog are what help him triumph. It's not that Gladwell's formula has worn thin -- it's that it doesn't seem particularly suited to his theme. Reading Gladwell's work is usually inspiring in addition to thought-provoking. Whether it's Outliers ("Don't feel bad -- success is a matter of dumb luck") or The Tipping Point ("You, too, are a part of the chain that makes a successful product") or Blink ("Just go with your gut"), Gladwell has the ability to give the reader a warm fuzzy feeling inside. But with David and Goliath I felt that, if anything, I wasn't enough of an underdog to succeed. Instead of leaving me feeling that my ho-hum life was perfectly acceptable (or at least allowing me to forget about my ho-hum life for a while), David and Goliath left me feeling strangely inadequate. The anecdotes weren't particularly satisfying, either. Usually, the personal stories that Gladwell uses to exemplify his theme are engaging and, dare one say it, the best part of the book. But few of these were fully fleshed out. For instance, the story of a woman who gave up studies in a STEM field because she felt inadequate in a highly competitive college program was lacking in information. What field is she in now? Does she have a passion for her work? If so, then maybe she didn't have enough passion to continue in her STEM studies and we shouldn't fault, but praise, the program she was in, because it made her realize that she should be somewhere else. (As a side note, this woman does express dismay that she didn't continue in her STEM work, but how can we not discount that as merely middle age doubt without more information?). Another individual profiled by Gladwell seemingly fails to fulfill his potential as well, yet the quotes from him indicate he is perfectly satisfied with his current career. Usually I flow right along with Gladwell's themes, but again and again in this book I found myself questioning his examples. Perhaps most disturbing is the profile of an extremely poor child who grows up to become the Vice President of Goldman Sachs. This tidbit of information closes a chapter and Gladwell avoids entirely the question: "What happens when David becomes Goliath?" The resulting train of thought is unfortunate and detracts from his theme. In his next outing, I'd like to see Gladwell tackle the notion of success itself. How do we define it? What, if anything, does one have to give up in order to "succeed"? 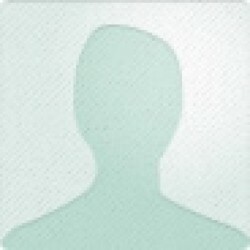 How often does the individual lose himself in the bargain? Don't let me mislead you -- David and Goliath is still a good book. Gladwell's writing is exceptional and his ideas intriguing. Kudos to him for having the courage and integrity to say that his research has caused him to (somewhat) change his stance on affirmative action since Outliers. But I'm used to Gladwell producing great books and this just wasn't up to par. I would definitely recommend David and Goliath. But if you haven't read Gladwell before, start with Outliers first. Sister Carrie is one of those novels that you frequently hear mentioned in nineteenth century literary criticism but probably isn't something you would go out of your way to pick up at the library -- one of the lesser "classics" that you might miss because there's so many others to read. If you're not a scholar you've probably never heard of it. The novel follows the story of Carrie Meeber, a young woman who moves from a small town to Chicago in a naive quest for something better. After a falling out with the sister she is boarding with, Carrie becomes the kept woman of young man named Drouet. It is through Drouet that Carrie meets Hurstwood, a suave hotel manager that promises her more than her life with Drouet. Carrie runs off to New York City with Hurstwood, becomes a successful actress, and eventually drops Hurstwood as well when she is seduced by the sparkling wealthy elite of the city. Carrie herself is not a completely bad person, but she isn't terribly likable either. She frequently feels an empathy for others that is washed quickly from her mind. Despite the novel being named after her character, Carrie ends up being rather a cipher, a symbol for the gnawing desire for luxury that even the most pious can feel. The reader isn't given nearly as much access into her thoughts as we are of Hurstwood. The latter's decent into depression and poverty after leaving his family for Carrie can feel a little too drawn out at times, but perhaps this is Theodore Dreiser's way of brutally exposing the reader to the man's circumstances without offering respite. Dreiser was a newspaper man before the publication of Sister Carrie and it shows. We are treated to intricate descriptions of department stores, apartments, and various denizens of Chicago and New York. For some readers this language might be a bit chewy, but in certain moments such attention to detail really glows. There is section in particular about the "Captain" -- a poor man who stands on a street corner of New York to beg for beds for his brethren every evening -- that leaves the reader lost in thought long after the section concludes, something I particularly relish. In addition, small moments of charity in this novel about grasping desire stand out -- Drouet's affability and sympathetic nature, the above mentioned "Captain" and his good deeds, the striking workers who try to peacefully talk the trolley car scabs into leaving, the restaurant that offers free bread to anyone in need at midnight. Such instances betray an undercurrent of optimism in an otherwise cool and objective piece of literature. 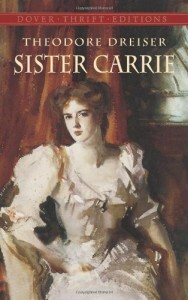 Sister Carrie certainly isn't for everyone and not nearly as accessible as other realistic/naturalistic works of the nineteenth century, but it provides an interesting glimpse into a historical period long past with an uncomfortably still-relevant theme about the American desire for "more".